As a bank with an established footprint in 20 African countries, it's no exaggeration to say that Standard Bank plays an important role in driving growth and innovation on the continent. 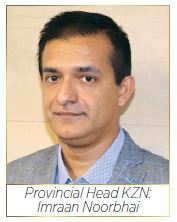 Imraan Noorbhai, Standard Bank Provincial Head KwaZulu-Natal says, "We see ourselves as more than just a bank and measure our value beyond financial outcomes. By using the fundamental power of financial services, we have been able to make many positive contributions, socially, economically and environmentally. Every Standard Banker plays a part in delivering our purpose and it is through this commitment that we continue to contribute to the prosperity and wellbeing of the societies in which we operate, positively driving Africa's growth in a sustainable and inclusive way." Imraan is supported by a committed leadership team with Hameed Noormahomed as Head Business Banking, Nathan Govender as Head of Commercial Banking, Mano Singh as Wealth Head KZN and Lisa Forster as Head of Wealth and Investments KZN. "Through these dedicated units with specialist staff, we offer a wide range of solutions to our customers, from the most basic to the most sophisticated of financial services. Our aim is to ensure that our customers' requirements are always met through the most cost effective and convenient methods we can offer them," adds Imraan. Retail banking comprises the following customer segments: Small and Medium Enterprises, Private Banking, Prestige and Middle market offerings and non-relationship banking products and services. Whether you want to transact, save or borrow, Standard Bank Retail Banking has a tailored financial solution for you. We have recently enhanced our online banking solutions through our digital platforms. Our representation spans across all municipal boundaries within KZN, represented by six geographic regions i.e. Dolphin Coast, Hibiscus Coast, Drakensberg, Msunduzi, Zululand and eThekwini Areas. We are always ready to serve you through our digital, selfservice and branch channels." As South Africa's leading Business Bank, our Business Banking segment within KZN comprises five suites spanning the entire province namely; Dolphin, Hibiscus, eThekwini, Msundusi and Zululand. We offer business solutions across conventional banking to meet our clients' business needs, savings and investment options to help them achieve their business goals and business loans to meet both their short and long term financial obligations. These include transactional accounts and lending facilities, structured working capital finance, commercial property finance, merchant transaction solutions, fleet finance, insurance and financial planning and fiduciary advice. Furthermore, we also offer Shari'ah banking solutions from the most elementary of savings and investments to the most complex of commercial transactions such as our FECs which launched in the last 18 months. The products and solutions we offer are designed to enhance the experience of our customers and facilitate growth in this exciting province. In doing so, we understand that our commercial success and social relevance over the long term depends on placing our clients at the centre of everything we do and ensuring that the outcomes of our activities are a catalyst for growth on this continent we call home. This is achieved through the expertise of our account executives, account analysts and customer service consultants as we can deliver a holistic customer value proposition to our Business Banking customers, which includes an understanding of the ecosystem within which they operate. Our purpose as Commercial Banking is to create and deliver value to our entrepreneurial clients, providing them with financial and nonfinancial solutions as partners for growth within and outside of South Africa. We support businesses with a turnover of between R300 million and R1.3 billion. Through the expertise of our relationship managers and our universal banking approach, we are able to provide excellent client service and solutions globally. We understand where our clients are in their investment lifecycle and they are at the centre of what we do. Our cultural drivers are centred around the three pillars: living the client experience; collaboration; as well as openness and trusting, thus helping us in creating impact in the societies within which we operate. Standard Bank Wealth KZN seamlessly delivers wealth solutions to our clients to protect, grow and manage their individual needs. In doing so, our purpose is to provide financial peace of mind by enabling our clients to achieve their wealth ambi-tions through best of breed solutions in our various suites: Investment (investment planning, offshore investing, online share trading), insurance (short term; life) and fiduciary (wills and estate planning). Our advice framework is designed to deliver our services and solutions (Individual and Commercial) through our trusted financial experts with simplicity and impactful service, while enriching people's lives in a long-term relationship built on the core value of trust. Our Wealth Management Philosophy centres on managing, growing and protecting the generational wealth of our clients and their families. Our goals driven investment approach allows you to take a long-term view of your investments, whilst simultaneously meeting your short-term lifestyle needs. As your financial partner, our aim is to accompany you through each stage of your life, giving purpose to your wealth and ensuring you can leave a lasting legacy. Nature of Business: Corporate and Investment Banking. To be the leading financial services organisation in, for and across Africa, delivering exceptional client experiences and superior value.